George's scleroderma is one of 15 diseases the Veterans' Administration determined could have been caused by contaminated drinking water at Marine base Camp LeJeune. And Congress passed a law in 2012 so anyone who served there between 1953 and 1987, and who has one of those diseases, is automatically eligible for VA health care. 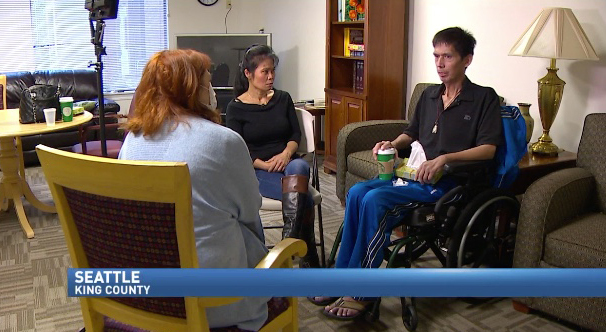 In October the KOMO Investigators asked Secretary Robert McDonald about Spike George. He's battling a disease the VA already determined is service related. But not only is the VA not paying him disability, it's also stopped answering any calls or questions about his case. Spike George can't wait much longer. He suffers from scleroderma. It's a progressive disease that makes it difficult to breathe and impossible to eat. He's so weak he can't really walk anymore. George has been in and out of the hospital for successive surgeries and bouts of pneumonia this past year. We had to ask him to drop his normally stoic demeanor to tell us how he's really doing. George admits, the reality is harsh. "There's times that I think how long? How long do I have to put up with this? How long am I going to be here ... suffering?"